I can't believe I'm the first to give this excellent episode a 5! In my mind this is a classic. Al jams with a sandwich for God's sakes!! agree this is a great episode, sandwich jamming was hilarious "you got cold cuts in your blood, man"
I remember seeing "Al plays a sandwich" as one of the reasons on MWC's Jump The Shark page. "Living it up with the geezers of rock!" I heart ageing rock stars. I think that parts hilarious, Its so bizzare but its just Al all the way. Mark Lindsay had a script for sale. Pity it's sold, but look - rare pic! Als' mean sandwich playing and the Old Aid song make this a 5 star episode! All the rock stars call Al some alternative of "Axl", except one, who actually calls him Al. I think it was Robbie Krieger. 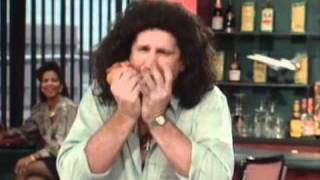 My favorite episode for the simple reason that Al played a pastrami sandwich. The first time I ever saw it I laughed so hard I cried, lol. I tried to make my name Axl Bundy when I joined here but it was taken. Mr. Empty Pants wrote: I tried to make my name Axl Bundy when I joined here but it was taken. There should be a rule that if someone with a cool username hasn't posted in, like, forever, then they shouldn't have a right to use the name anymore. That would awesome, lol. I would change my name and the pic above would be my avatar. It's not like the guy is going to notice. Plus, that guy's name could be changed to Seven Lover or something. Dr. Shoe wrote: It's not like the guy is going to notice. Plus, that guy's name could be changed to Seven Lover or something.